Learning how to distill essential oils isn’t as hard as you may think. As their popularity (and cost!) continues to increase, more people are looking into making their own not only to save money, but because it’s the only way you’ll be able to guarantee their purity. Just like growing your own food, you can rest assured that the oils you use for your family’s medicine is the real deal if you distill your own! Before we learn how to distill essential oils, let’s take a peek and understand what they are and why you may want to DIY. Essential oils are nature in its most concentrated form. They are extracted directly from biomass (the bark, flowers, fruit, leaves, nut, resin or roots of a plant or tree) and just one drop contains a complex network of molecules that deliver different effects to the body. Burning aromatic plant materials for incense has been a religious tradition throughout recorded history and, as far as we can tell, these practices ushered in the dawn of aromatherapy. 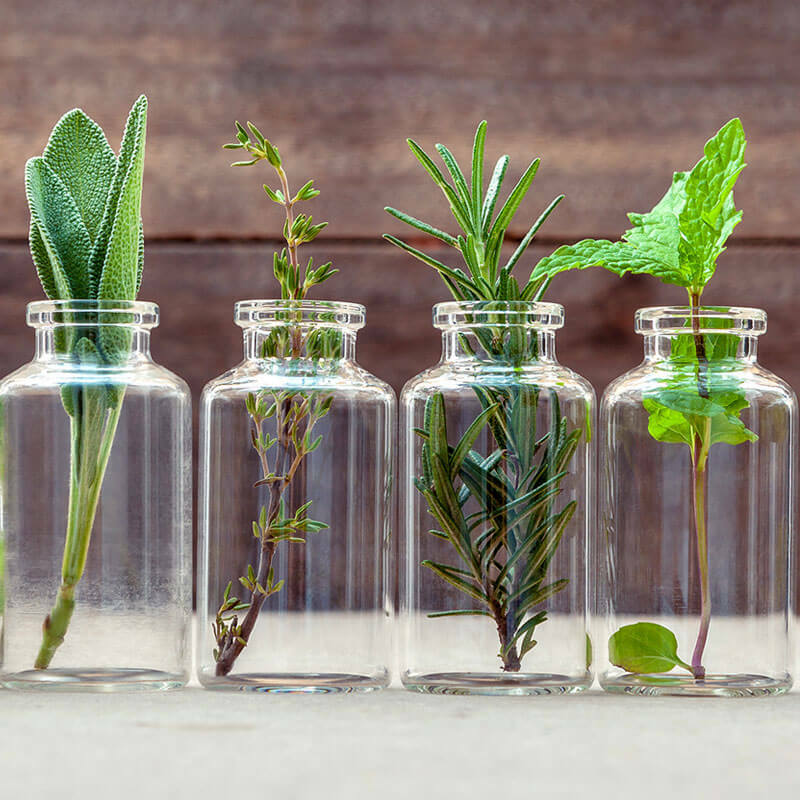 Also known as volatile oils because they evaporate readily, essential oils are the lipophilic (“fat loving”), hydrophobic (“water hating”) volatile organic compounds that are found in aromatic plants. Meaning, they have the tendency to dissolve or combine with fats or lipids, while repelling or not mixing with water. Somewhat of a misnomer, essential oils aren’t “oily” like the fixed, culinary oils we just discussed and they usually do not leave a residue when applied on your skin. They are generally insoluble in water, soluble in alcohol and fixed oils, and can dissolve fatty materials such as grease. Once referred to as “essential” because they were thought to represent the very essence of odor and flavor, essential oils are not “essential” for life at all. Technically speaking, essential oils are secondary metabolites and—like alkaloids, bitters, gums, steroids, and tannins – are the byproduct of photosynthesis. Primary metabolites like glucose, however are necessary to all life and are thus the primary goal of photosynthesis. Although they may not be “necessary” for life, I can think of no other substance on the planet that I would consider essential to have in my medicine cabinet! Used medicinally for thousands of years through a variety of forms, the true power of these oils is their ability to support your body’s natural healing systems. And their power to heal is so effective that science has begun to take note, with thousands of peer-reviewed articles published in databases around the world discussing their efficacy. What we do know, however, is that virtually every culture dating back to the beginning of time used aromatic plant materials in their sacred rituals as incense, in their body care as ointments and perfumes, and in their medicine as poultices, salves, and tinctures. Robert Pappas, PhD, chemist and the founder of Essential Oils University, told me during our interview for my first Essential Oils Revolution telesummit that he estimates more than 75% of all the essential oils on the market are adulterated. Meaning, they are either diluted or contaminated with synthetic materials. Purity and adulteration are extremely important topics when considering which ones to buy and is one of the main reasons why people are wanting to learn how to distill essential oils. To debunk two myths out there in one fell swoop, it’s important to keep in mind that 1) purity doesn’t guarantee that you’ll enjoy a therapeutic effect, and 2) purity doesn’t guarantee safety. If you try an oil and do not get the desired result, it doesn’t necessarily mean that the oil is fake or not “pure.” It may be more about finding the one that works for you because of the chemical constituents that are within each batch, which may mean that you purchase from several different brands. And don’t believe the “detox” myth. If you apply essential oils straight (neat) on your skin and experience a rash, bumps or other adverse effects such as swelling or itching, this is not a matter of the essential oil cleansing your body of harmful toxins. Rather, this is a result of irritation or is potentially evidence that you have been sensitized to the oil you applied neat. Is organic necessary? Not necessarily. Essential oils can contain pesticide residues, even certified organic essential oils. Passive contamination can occur even though a farmer does not actively use pesticides. Pesticide contamination occurs because of “acts of nature” such as a drift wind or water runoff from a neighboring field, and incorrect essential oil storage. Pesticides easily dissolve in fats and lipids, making the transition to the essential oil possible. Cold-pressed citrus essential oils are more likely to contain pesticide residues than steam-distilled citrus because pesticides tend to be hydrophilic, thermostable, and volatile. Does the company have a relationship with their distillers? Can the company readily supply a batch-specific MS/GC report on the oil it sells? Can the company readily provide material safety data sheets (SDS) upon request? What is the common name, Latin name (exact genus and species), country of origin, part of plant processed, and type of extraction (distillation or expression), and how it was grown (organic, wild-crafted, traditional, indigenously sourced)? Note, not all essential oils are steam distilled. Citrus peels are generally expressed (“cold-pressed”). Other aromatics include CO2 extracts and absolutes. Here’s a quick breakdown of the most common extraction methods. CO2 Extraction – Supercritical fluid extraction (SFE) uses supercritical carbon dioxide (sCO2), which is a fluid state where CO2 is held at or above its critical temperature and critical pressure. In its supercritical, fluid state, it has an uncanny ability to perform as a commercial and industrial solvent. Unlike other commonly used toxic solvents, like hexane, CO2 is safe and environmental friendly. The resulting essential oil-based extract is currently all the rage in the aromatherapy community. Distillation – Primarily accomplished with steam, essential oils can also be water-and-steam distilled as well as steam-vacuum distilled. The end products are hydrosols (“floral waters”) and essential oils. Expression – Primarily reserved for citrus peels, mechanical pressing (aka “cold pressing”) literally squeezes the essential oils out of the rind of a fruit. At one point in history, this was done by hand using a sponge to collect the oil, but those days are long gone. Citrus oils can also be steam distilled, but the aroma has a tendency to change considerably and the therapeutic properties are much different. Solvent extraction – A type of liquid-to-liquid extraction, this is what our Biblical ancestors utilized to extract miniscule amounts of frankincense essential oil out of the resin by placing it in olive oil for a short time. Today, it is used for delicate, low essential oil-content flowers like rose, jasmine, mimosa and others. The process has been expedited and much more of the essential oil can be extracted by using petroleum ether or chemical solvents like ethanol and hexane; all of which have safety concerns for us and for the environment. For this reason, safer alternatives like CO2 extraction are becoming more popular. Solvent extraction produces a waxy, fatty substance known as a concrete. When the concrete is washed with alcohol, the fat is separated and the remaining end product contains volatile and non-volatile principles referred to as an absolute. If you get the right kit, learning how to distill essential oils is not hard at all. Like anything, it just takes some time and getting used to and, once you figure it out, it’s a cinch! Your average distillation kit will range from $300 – $600 and you can expect to recoup your expenses pretty quickly. Generally a 3 hour-process, you should get around 3-4 ml of EO and 1 quart of hydrosol per distillation. 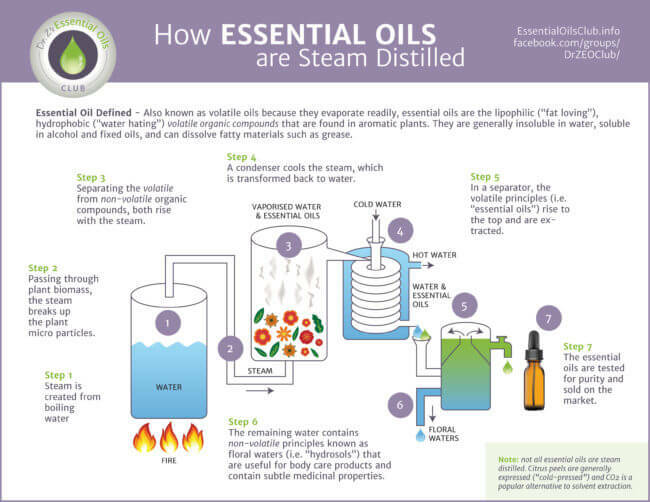 The infographic above was destined to give you a visual representation as you learn how to distill essential oils. Personally, the concept of steam distillation was somewhat confusing to me before I saw it and I hope you find it helpful. If you’d like to download a high-res copy for yourself, you can CLICK HERE. Step 2 – Passing through plant biomass, the steam breaks up the plant micro particles. Step 3 – Separating the volatile from non-volatile organic compounds, both rise with the steam. Step 4 – A condenser cools the steam, which is transformed back to water. Step 5 – In a separator, the volatile principles (i.e. “essential oils”) rise to the top and are extracted. Step 6 – The remaining water contains non-volatile principles known as floral waters (i.e. “hydrosols”) that are useful for body care products and contain subtle medicinal properties. Step 7 – The essential oils are tested for purity and sold on the market. Break up plant matter (leaves, flowers, bark, etc. ), but not so small that the biomass falls through netting at bottom of the flask. During for your next distillation, fill the water flask with hydrosols from previous distillations to extract even more essential oils! Be sure to store in the refrigerator to prevent bacterial overgrowth. It takes about 30 minutes for things to start to kick in and the process will last around 3 hours. Try to get an “open-to-atmosphere” design because the steam pressure can never build up in the system, making the system much safer to operate and insuring that the distillation process will take place at exactly 100 degrees C (at sea level). Using separate flasks for boiling and biomass is best because it helps prevent overheating or possibly burning your plant matter. Use a receiver, not a “catch vessel” because, when the distillation is complete, the contents of the “catch vessel” must then be transferred to a separatory funnel in order to separate the water and oil layers. This is time and labor intensive. Alternatively, a receiver design captures both “lighter-than-water”, and “heavier-than-water” oils and continuously and automatically drains off any water (“Hydrosol”) that’s being condensed. Super easy! Definitely not for everyone, learning how to distill essential oils is an empowering experience. It takes your self-sufficiency and DIY experience to another level. I wholeheartedly encourage you to try it and out and keep us posted. Leave a comment below and share your own home distilling tips!